Buried Secrets - In the first room of the temple (1) meet Wirtan who tells you about the horrible fate that has befallen the priest of Eothas in Golden Valley. The Eothas buried in the sealing of his temple under a pile of rocks. Wirtan will give a proper burial and need your help - you shall bring him the remains of the priests from the second floor of the Temple. The second floor you reach in the north-west (A2). To open the door there, you must first solve puzzles (sequence: right bell, medium bell, bell left, right bell). On the second floor you have the shadow in the valve chamber in the far south (6) defeat, turn the valve to drain the water in the well region (7) and remove the keys from the silver robe. With it, you can open a bit north (8) and you gain access to the south-eastern area of the map (9) the door. Here you will find not only the remains of long-dead priest, but also a spirit that you can know more about his death and Wirtans connect to it more. Then you can go back to the first floor, front Wirtan with the seen and get the quest to end. At the entrance of the underground temple (1) you meet Wirtan from whom you get the quest in this area: Buried Secrets. Wirtan told you how it came about that the temple of Eothas spilled and asks you about bringing him the bones of the priest from the second floor of the temple so he can bury him properly. What motive pursued Wirtan, can not squeeze out of it at this time. He offers you coins in return for your help - he also indicated that the temple still not been activated and its treasures untouched since the bottom. Similarly, he warns you of spiders, Skuldrn and traps, but does not say anything about the dangerous shadow that await you on the second floor. 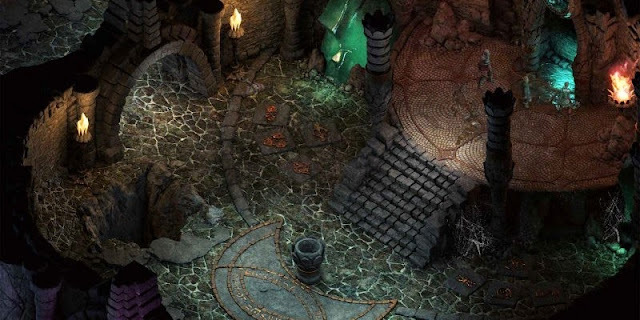 Happen one of the two Pillars of Eternity: walkthrough quests, boss battles and territories archway and you reach a room that leads as a kind of link between two areas - both bring you sooner or later at your destination. Go straight ahead once in the small room with the beds (2) in the center of the map - you can find the note of an initiate in one of the containers, which states that instead of the second bell shall first propose the larger bell. This information will be important later. Leave the room, turn left and fight against two and three spiders Ivory Ivory spider lings and two venom spider glands. In the rubble you will find two jaspers and a letter that has only atmospheric value. Change in the stealth mode and you recognize the lamp on the northwest wall as a switch that opens a secret passage. As a result, you have quick access to the entire west wing of the first floor. Pass through the open part of the wall, defeat the two Skuldr puppies and then come closer to the crate in the West - notice that she is provided with a poison spear trap. With a mechanical life of at least 4 you can defuse the case - otherwise you will have the opportunity to bring a part of your group to safety and then trigger the trap with a character, so that only he would collect the damages. Inside the box are a grenade and an amulet of health. Step into the adjacent room to the south and sit down there through against three Skuldr puppies and a Skuldr King. From the vase can take and then interact with the soul of dwarf spirit. In a vision, you realize a ritual bell that reveals you that the first and the last chime of the 'right hand' come. You will need this information the same, because if you leave the bathing room and go north, then you come across the bells (5) have just seen in vision. Use the information from the note of the initiate and the vision to beat the bells in the correct order: right bell, medium bell, bell left, right bell. The door right next to you opens, you can up the stairs to the second floor (A2) to read and take appropriate section of the solution a little further down. Those who want to explore the east wing of the first floor before reading further here. Make your way to the center of the map and go from there to the east, to the scriptorium where you put four Skuldr in the way. In the upper bookcase you will find a Scroll of shocking touch and 16 copper pieces, in the ruins of a good sword. The small study room adjacent to the northwest you can also take a war hammer and a lockpick. Leave the scriptorium in the southeast and you come to a temple room, which is supported by four massive pillars and leads to a podium in the Northeast. Defeat the two ivory spiders and the five Ivory spider lings to you to access to the podium Pillars of Eternity: walkthrough quests, boss battles and territories procure and there may interact with the soul of the spirit. If you change to the podium in the stealth mode, then you can still see a loose brick, behind which is a Potion of weak regeneration, a blood stone and six copper pieces. Continue to the southeast in order to end up back in the room, which acts as a link between the areas. From here, the only thing missing in the East with the three Will'O'Wisps and a loose brick, behind which can be found three and nine copper pieces. You're in the first floor for the time being finish and you can go up the stairs in the northwest (A2) go further. The only way is to the southeast, where you can expect the type of enemy around the corner for the first time, which is characteristic for this area: the shadow. For now you fight only against a copy of this species - watch the teleportation of the shadow and pause in between the fight to your group to rearrange. Then you have no trouble. Step into the area southwest of you and sit down there against three shadows. Then go into stealth mode to recognize and defuse the case to the upper chest. Crack the lock on the lower chest. You can now a faint ring of protection, plunder a potion of the weak recovery and a good tank breaker. Leave the room through the lower door and you reach a large T-shaped space that forms the center of the map and represents the link to all other rooms. Before you enter another room, at first from the entire room and defeat the three shadows staying scattered over the entire surface. Then return to the western part of the space back, once store and enter the room in the southwest. Here you get there with four shadows in one go and do a phantom. The shadows and the phantom appear delayed. If you have difficulties with the fight, wait until the shadows have their first teleportation behind them and attack them then targeted with AOE spells. Use the walls to your advantage and post your group members so that the shadows they can not impose their cold spell. Once you have won, you can enter the room and see the two traps in stealth mode with which the sarcophagi are dotted. Disarm them and get some leather armor, six silver pennies and the cape of a Eothas priest. Go back to the large T-shaped space and take the stretch straight to the northeast. You run into a room where two shadows and phantoms are two and a hidden reservoir in the north-west wall, Where a bloodstone, boss battles and territories Amethysts, agate can see three copper pieces. Return once more to the T-shaped space back and this time take the turnoff to the southeast until you reach the locked door (8) and the flooded region (7). To get access to the flooded area, you have to turn the valve (6) in the space opposite the locked door. But beware: wait five shadow on you! So make sure before you enter you tactically oriented in the fight against the four shadows and the Phantom in the southwest. If you still have problems, recruit for this battle one or more additional companions in Pasca in "Black Dog". Once you success, you can turn the valve and give you access to the previously flooded area with the fountain (7). Defeat the two smaller black sludges there and then bring you out of the robe the shimmering silver key. This allows the locked door (8) in the north open a little further, the need to happen to her if you are to complete the quest "Buried Secrets". Fight through a flood of two shadows, a phantom and three smaller black sludges and then activate the lever in the southeast - the space to the corpse of Eothas priest. Before you interact with the soul, the chest opens right to obtain the dispute Flegel Gaun’s share, take from the vase five silver pennies, loot two from the chest to the left and then place in stealth mode far right of the room a stretched chest that a potion of the ghost shield, a scroll of chaos walk, two turquoise, six copper Skeyt and a book entails. Interact well with the soul of the priest and your main character has a vision - he sees the final moments of the priests, before the temple s sealed and he sees that Wirtan has abandoned the priest. You can now collect the remains and return to Wirtan. To do this you can either take the long way via the exit, it passes over the to the second floor are (A4) or the short path that leads but a horde of enemies. If you want to take the shortcut, then go back to the room with the pool and take from there the stairs to the north. Once at the top you have to get in a round against two Skuldr puppies, two Skuldr, and enforce Skuldr two kings before you can continue. In the hands of the statue Durable Vigil of the pilgrims is hidden. Take the exit (A5) back to the first floor - you're done here. If you took the long way back to the first floor, go directly to Wirtan. If you have chosen the abbreviation, then take your group in a new space in the north of the map (A3), on the north-west wall there are countless candles. You can click the candles - if you Eder have in the group, you will find out that they have served the faithful of Eothas for a redemption ritual. If you let the candles untouched, nothing happens - it deletes one of the candles, so there Eder to comment on your thoughtlessness, if you have seen him there. Head over now to Wirtan, who was still in the lobby (1) waiting for your return. The quest "Buried Secrets" can be terminated in different ways in conversation with him. No matter what you say to him - Demand in any case the promised money from him to get 100 pieces of copper. You then have the first option, Wirtan to confront either with what you have seen in the vision or to let him get away unharmed. Furthermore, you can then either he passed the remains of the priest or keep them for you. And finally can you Wirtan either attack (call worsens, but you can leather armor and two silver pennies loot his corpse), ask him to Golden Valley forever to leave (Reputation increases) or point out to him that it is not yet too late to make amends (Reputation increases). With a correspondingly high intelligence or power value you can bring in experience that Wirtan for Lord Raedric worked and then when the temple should be filled in during the call also lied when he was asked if the priest nor are down there. So he is responsible for her death and persecuted in the salvage your own designs - the temple should eventually be reopened and someone would find the remains, then it would be clear that Wirtan has lied back then. Make a choice how you want to proceed with Wirtan and then leave the temple on the south-output (A1).